Join the discussion on our forums! Come discuss Portal Overfiend over in our dedicated Portal Overfiend discussion topic. It’s like an interdimensional game of demon tag. I don't get why this isn't a warlock card. Great art though. 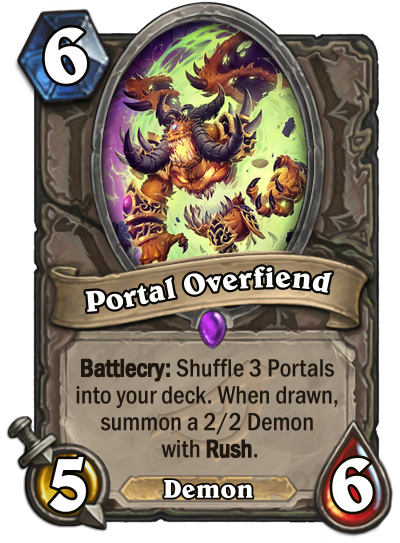 This may be a bit slow but might be good, it depends if the portals draw an additional card alongside the portal or just summons the minion and nothing else, which could waste card draw. It's an expansive version of Portal Keeper. If you want the effect I would probably include Portal Keeper first. If thinking with portals is the way to cake, we can run 4 portal-demons. Notable synergies include: Arcane Fletcher, The Soularium, Khadgar, Myra's Unstable Element, Jumbo Imp synergy maybe? A lot more stuff I am probably missing. Do you draw another card after the 2/2 demon?